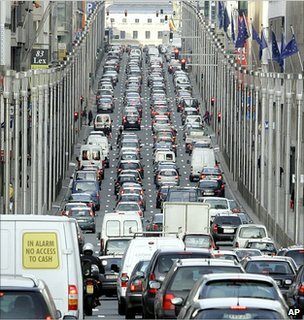 It is a grotesque carousel: Belgian taxpayers’s money is used to encourage employers to reward their staff with company cars; the cars exacerbate the rate of accidents and CO2 emissions, and aggravate the very congestion which makes Belgian drivers uniquely petulent and aggressive. And all of this at a time of stretched public budgets and austerity. This is one of the depressing conclusions to be drawn from the latest economic survey of Belgium by the OECD. Among the OECD’s recommendations are to abolish tax breaks for company cars, diesel cars and diesel as a fuel, and to introduce a road pricing system and differentiated public transport fares. As a group based in Europe’s most congested city, EUCG hope politicians, and employers, take notice and address the absurd situation which discriminates against people who prefer more environmentally-friendly modes of transport. Next Where do you park your bike in central Brussels?